Most women can agree that having dark circles under their eyes is one of their main beauty insecurities. It’s no secret the “panda eyes” do not just come from lack of sleep. 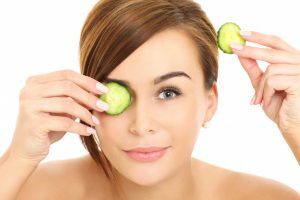 Diet, sun exposure, allergies, heredity, contact dermatitis, eczema and thinning of the skin related are all common causes of dark under eye circles. Being sleep deprived is the most common cause and can be simple to prevent, however oversleeping can cause dark eye circles as well. If the dark circles appeared in early childhood, one can assume it is an inherited trait that some people may or may not grow out of. Nasal congestion from allergies dilates the blood vessels around the eyes making the circles more apparent. Iron deficiency can also stop blood circulation to carry oxygen into the eye tissues. Excessive drinking and smoking is also a main contributor. Since alcohol dehydrates the body, after a night of heavy drinking it is important to drink lots of water and apply moisturizer to the under eye area. Controlling the amount of sodium your body intakes will also help with under eye circles because salt causes fluid retention in the body as well as the eye area. One should seek medical attention in rare cases like hypothyroidism which is a disorder that does not let the thyroid gland produce enough thyroid hormone, liver disease and Trichinosis, a disease caused by parasite worms.